We all love rivers. From gently babbling waters to the mightily raging rapids, we are always in awe. Although the best we can do is stare at it from a distance, maybe sit at a beach and take a dip. All that is an amazing experience itself but not just enough. The real, most authentic experience of witnessing a river is while flowing with it while in it. To experience its monstrosity while battling through a rapid and to inhale peace while floating smoothly through gorgeous landscapes. The best known way of doing all that – a kayak expedition. When you think of rivers, a handful of names come to mind. Ganga is usually one of them. The most intriguing, majestic, divine, grand and beautiful river on planet Earth. Ganga is as grand as life itself. It flows freely, coursing through the land, ploughing a valley of its own. My first ever kayak expedition was fortunately on Ganga itself. I’m sure most of you have landed on this article owing to your association with kayaking in some way. Although there will be many of you alien to the world of kayaking and kayak expedition. For those of you I’d first like to talk about my journey prior to the expedition. Before undertaking the kayak expedition, I had to undergo a training course with Team 4 Adventure. I did a 4 day kayaking course with them and with a fortunate stroke of serendipity I became an employ there. White water Kayaking is a world of spills, thrills, chills and adrenaline. Although to experience the true givings of white water kayaking, one needs to learn the art. To a newbie or an outsider, kayaking might just appear to be some form of boating. Which it is but it is umpteen times more thrilling. I did a 4 day beginners course followed by few river runs on the main commercial white water stretch of Ganga. Through the course skills like paddling, turning, bracing, leaning and eskimo rescues are imparted. These skills lay the foundation of your kayaking journey. The stronger these skills the farther you can go in breaking the white. 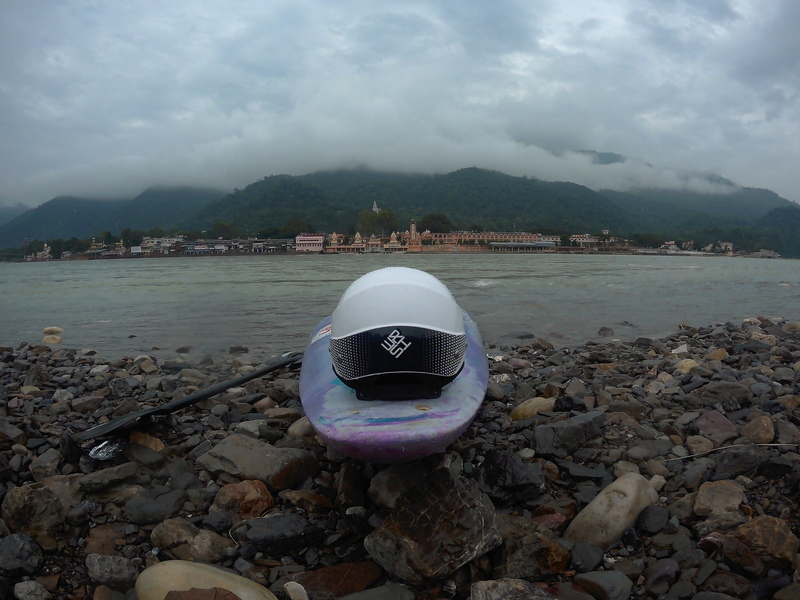 So my first kayak expedition started from Devaprayag. The spot from where Ganga actually begins. Devaprayag is the confluence of two rivers, Alakananda and Bhagirathi namely. These two merge and Ganga is formed. The kayak expedition was 32 Kms long and was to span a period of 2 days. 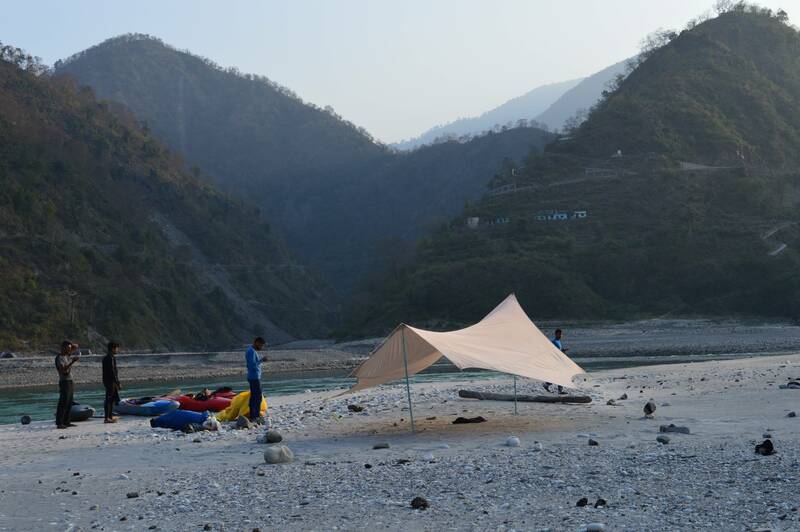 On the first day we kayaked for roughly 15 kms until we set a very basic camp at Byas Ghat. Byas Ghat is long white sand beach with a forest behind and a mesmerizing panoramic view in the front. A picture perfect spot for riverside camping. More vividly, our camp was nothing but a fly shelter. So the kayak expedition was a self supported one. Which implied that we were carrying minimalistic stuff. Sleeping bags to crash in, extremely light food, ultralight cooking utensils, tiny butane tanks and so on. Everything in our kayaks. I was not alone, I was accompanied by two super safety kayakers and two newcomers like myself. I would repeat what I said in the beginning, a kayak expedition is the best way to experience a river. Across the entire trip there were many rapids. These rapids though are not as intense as the ones near Rishikesh, which is the hub of whitewater kayaking in India. Also the place where we run our courses. So for a person with a 4 day kayak course behind him, the rapids were challenging yet doable. In kayaking the better your skills get, the bigger and more crazy rapids you can run through. You can never conquer the might of a river but you can gently revolt against it in a beautiful way through kayaking. The experience of the expedition was surreal. I felt so close to the nature and the fact that we were traveling long distances in a river was amazing. Many people might have traveled long distances by sea or rivers but its mostly in driven vehicles. Ships, streamers, yachts, etc. The experience of kayaking though is completely different. You have control of the boat, you’re the driver. Yes. Anyone who is fit, comfortable staying in water without any paranoia can easily complete this expedition. The only prerequisite for undertaking the expedition is that one should have completed a Basic Kayaking Course for Beginners. So don’t have any second thoughts, just take the leap of faith and join this magical world of white water kayaking.